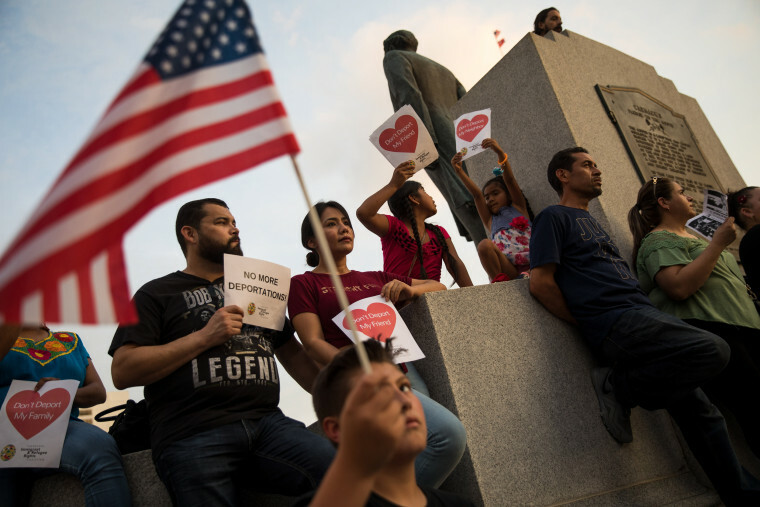 The U.S. is violating "well established Inter-American standards," such as rights to family and to seek asylum and protection," said petitioners. Dagoberto A Melchor Santacruz hasn’t seen his 16-year-old partially deaf son since the two came to the U.S. border to ask for asylum. Maria Andrés de la Cruz awaits reunification with her three young children that agents separated from her and put in an icy cold cell. Antonio Bol Paau has been unable to find out where his 12-year-old son is for days. Migrant advocates and attorneys accused the United States of human rights violations in an official complaint filed with the Inter-American Commission on Human Rights Thursday. The complaint came as activists protested in cities around the country against the Trump administration's latest tactic aimed at curtailing immigration. “The people are demanding to know #WhereAreTheChildren?” Well, the children are not with their parents,” Ana Maria Archila, co-executive director of the Center for Popular Democracy said in a statement about the protests on Thursday and Friday. The human rights emergency request was filed on behalf of Melchor Santacruz, de la Cruz, Bol Paau and three other parents and the children they were separated from after crossing the border into the United States. The complaint details those parents' and others' separations from their children. Efren Olivares, racial and economic justice director for the Texas Civil Rights Project, told reporters Friday that attorneys were able to determine the whereabouts of children of four of the parents after they called a government 1-800 hotline with names and birth dates. But Olivares said they had not been able to locate Bol Pau's since beginning their search May 24. "Maybe he will be in the system today or maybe tomorrow, or maybe he was entered incorrectly ... or ... the nightmare scenario would be he is missing," Olivares said. The Office of Refugee Resettlement, which takes custody of children separated from parents, does not give out information on what shelter children are in but gives information to a caseworker who then must contact the attorney or advocate. NBC News has emailed ORR to request comment. The human rights petition asks for the commission's intervention to “immediately stop a human rights and humanitarian crisis perpetrated by the U.S. government in the Texas-Mexico border." “In one particularly chilling example, immigration agents told two immigrant mothers that they were taking their daughters away to the bath — but they never returned, and the mothers have not seen them since,” the attorneys and advocates said in the petition. The petitioners complained in the request that dozens of minor children have been taken from their parents in the last month. In addition, parents and attorneys haven’t been told where the children are or whether parents and children will be reunited. The groups want the commission, part of the Organization of American States (OAS), to require the United States to reunite the five parents and their children immediately, to ensure that no parent is removed from the country without being allowed to decide whether to take their child with them and immediately stop prosecuting parents and separating them from their children. "The request for precautionary measures is grounded in the current ongoing and future violations of human rights as enshrined in inter-American treaties and instruments that the U.S. is legally bound to," said Leah Chavla of the Women's Refugee Commission. She said one of those instruments is the 1951 Convention on Refugees, which prohibits prosecution or punishment of asylum seekers, she said. The petitioners accused the U.S. government of violating internationally-recognized human rights and "well established Inter-American standards," such as rights to family, to seek asylum and protection, and minimum due process. “Toying with the lives of people fleeing violence to send a message is not only cruel but also a violation of international human rights and conventions to which the United States is a party,” said Efren Olivares, racial and economic justice director for the Texas Civil Rights Project, one of the groups that filed the emergency request. Attorney General Jeff Sessions announced May 7 the administration would separate children from parents as it stepped-up prosecutions of people who cross the border illegally. The administration has set a goal of 100 percent prosecutions of people who illegally cross the border, even if they are doing so to request asylum. "U.S. Marshals have not been authorized by Congress to place children in criminal detention facilities with their parents," said Devin O'Malley, a Department of Justice spokesman. Advocates have said that children have been kept from their parents while the parent is in jail awaiting prosecution on the misdemeanor infraction, while they serve their sentence — which can be time served as they awaited prosecution — and then while awaiting deportation. Some parents have been able to communicate with children while they are in immigration detention, but detainees are not allowed to receive phone calls unless they are specially arranged making keeping contact with children difficult. Agents told Melchor Santacruz, who arrived at the South Texas border from El Salvador around May 22, that asylum wasn’t available and that he couldn’t be with his son, according to the news release from advocates and attorneys. In addition to being partially deaf, his teenage son suffers frequent nosebleeds, the news release said. Border Patrol agents put de la Cruz’s three children — ages 11, 8 and 7 — in a cell that migrants call an “hielera,” which means ice chest because it is very cold. She was not asked why she had left her home country of Guatemala, which attorneys said was because of threats and violence. The agents told her she’d see her children again after her court hearing, but she hasn’t seen them yet, the news release said. Bol Paau and his son, from Guatemala, arrived May 22. Bol Paau was put in a detention cell and his son was made to wait outside it. When Bol Paau left the cell his son was gone, the release states. Also filing the petition were the University School of Law Immigration Clinic, the Women's Refugee Commission and García & García law firm in Texas. The Inter-American Human Rights Commission can adopt measures requiring its member states to take action in cases of human rights abuses. The United States is an OAS member state. Some of the protests on Friday were being held in front of Immigration and Customs Enforcement offices as well as the Department of Justice in Washington. Texas Congressman Joaquín Castro, a Democrat, spearheaded organization of a protest in San Antonio that was held Thursday night. “My grandmother came here as an orphan when she was brought here by relatives and she lost her parents before that," Castro told NBC News in a telephone interview before the rally. "I believe we can enforce immigration policies and still treat people as human beings and with respect."